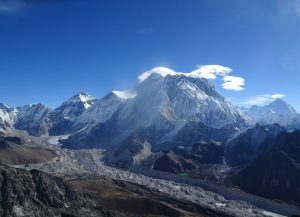 The Everest massif, the Khumbu glacier, and other towering giants seen from the summit of 6000 meters+ Lobuche peak (photo H. Colt). At 11:56, April 25, 2015 Nepal was shaken by a 7.8 magnitude earthquake that resulted in almost 10,000 deaths, left 3.5 million people homeless, and caused an estimated10 billion dollars total damage (about half of the country’s GDP). Seventeen days later, the death toll continued to rise as a magnitude 7.3 aftershock (followed by more than 400 additional, albeit smaller aftershocks) struck regions only a few miles east of Kathmandu. Meanwhile, in the famous Khumbu icefall, and particularly at Everest base camp (EBC), the April disaster prompted a massive avalanche, rockfall, and an air blast that flattened part of the camp, killing 15 people and injuring more than 70 others. In addition to 3 doctors and 1 medical assistant in residence at the Himalayan Rescue Association’s Everest Base Camp Clinic, known by climbers the world over as the Everest ER, there were also about 10 doctors from various specialties present with Everest climbing expeditions or trekking groups. The hurricane-force winds caused by pulverizing ice and the avalanche from 1000 meters above the camp destroyed the medical tent and most supplies. Communications with the outside world was limited, and emergency transports using private or military helicopters were initially impossible because of weather. Throughout the country, including at EBC, volunteers and health professionals worked together using limited resources, but without a previously elaborated disaster relief plan. From Kathmandu, and near the epicenter of the earthquake, doctors from the newly formed Nepal College of Chest Physicians (NCCP…no affiliation or connection with the ACCP of the United States) brought medicines, bandages, and much needed emergency medical care to disaster-stricken communities of thousands. An emphasis on humanitarian aid continued to dominate the activities of the slowly growing NCCP during the next years, but this month, Dr. Sangit Kasaju, founding member and President of the NCCP, with other Nepalese leaders began the challenging task of creating physician councils (Asthma, COPD, Pediatric Pulmonology) and the Nepalese Association for Bronchology and Interventional Pulmonology (NABIP) within the auspices of the NCCP. This NCCP’s very first national meeting was held in Kathmandu on October 26, 2018. It so happened that I was mountain climbing in the Himalayas last month, so it was with great pleasure, but with some degree of apprehension because weather in the mountains often causes flight delays between Lukla (2860 meters) and the capital city, that I was able to shorten my trip by a few days in order to return to Kathmandu and assist the NCCP with their very first meeting. The program was terrific (there will be a descriptive article in a future WABIP newsletter), the enthusiasm contagious, and promises from conference sponsors including eaders of the major pharmaceutical company Cipla, Serolab, Sanofi Pharmaceuticals and others in support of future NCCP events most encouraging. After the conference, Sangit and I got into a 4-wheel drive truck and drove several hours along winding dirt roads through valleys and hills to the village of Jalbire, close to the earthquake’s epicenter. It was wonderful to see how many homes had been rebuilt in the three years since the disaster. A conversation with farmers as well as with a young doctor at the government medical clinic there revealed a persistent need for medical assistance (for example, there are no electrocardiographic capabilities), healthcare-related education, and trauma services. Many villagers immediately recognized Sangit, who enthusiastically promised that the NCCP would continue to come regularly to the village to provide villagers with medications, instruction about lung health, general hygiene, and spirometry services. The future is promising! This entry was posted in Colt's Corner and tagged bronchoscopy, Education, everest, lung disease, medicine, nepal on November 6, 2018 by hcolt.